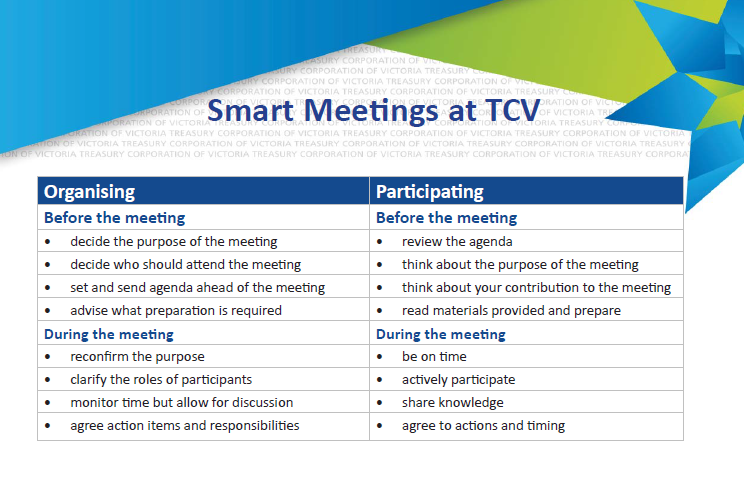 Do you run SMART meetings? What percentage of your time is spent in meetings? One study suggests middle managers spend 35% of their week in meetings, and upper managers spend even more time – almost 50% of their time in meetings. This same study suggests 15% of an organisation’s collective time is spent in meetings – and the even scarier part is that executives say 67% of meetings are unproductive. Effective Meetings – How do you know? Has it achieved the meeting’s objective? Has it done this in an appropriate amount of time? Do the participants feel that a suitable process was followed during the meeting? Were the ‘right’ people involved and were they able to contribute well? Were the decisions made that needed to be made? Are people clear about what is to be done next and by when? Think about the last meeting you were involved in. How would you answer these questions? 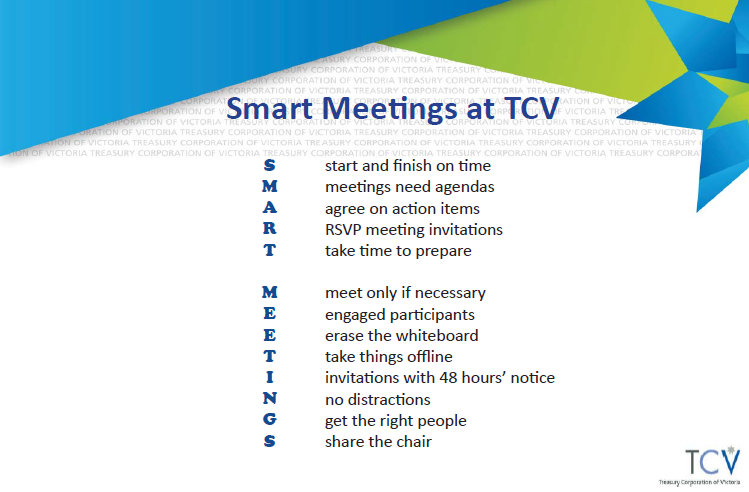 We were recently working again with one of early DiA client organisations, Treasury Corporation of Victoria (TCV) and happened to notice a great little laminated card that they have created to help bring about more effective meetings. A group of cross-functional team members worked together to come up with some practices they believe will help make time in meetings more effective. They created a simple SMART meetings laminated ‘mat’ and have shared this with everyone in the business, leaving a copy in all meeting rooms. All staff are encouraged to apply these steps – either in their role as an organiser or a participant in each meeting. Thanks to Agi and Tanya and their working group for sharing this with us and allowing us to share it in this blog. Click here to see previous blogs on meetings.